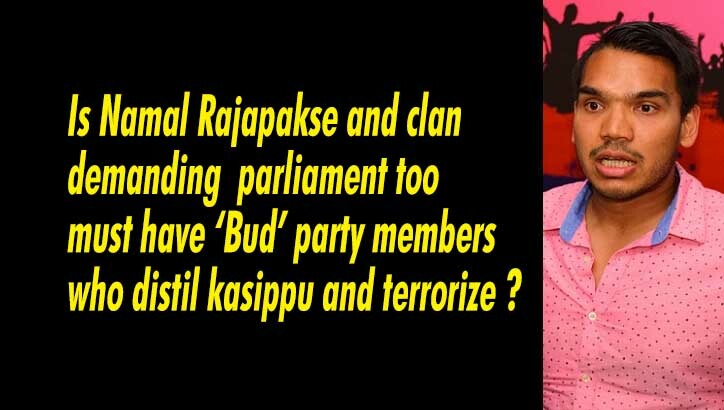 LEN - www.lankaenews.com | Is Namal Rajapakse and clan demanding parliament too must have ‘Bud’ party members who distil kasippu and terrorize ? (Lanka e News -02.Sep.2018, 5.30PM) It is a well and widely known fact that Namal Rajapakse and his clan are getting down the Rajapakse’s so called ‘force of the people’ to Colombo and staging protests with the hope to form their own government , countless plunders and robberies committed by them notwithstanding. ‘Mini governments’ (abounding with vagabonds and vagrants) have been established by them now . The ‘great feats’ of the vagrants and vagabonds were revealed by the newspapers recently. The first news report related to the arrest of a member of the Bud party of the Mawanella pradeshiya sabha twice within one week by the police.. This ‘wonderful’ Bud party member was arrested on charges of robbery on the first occasion , and on the second occasion within the same week he was apprehended in connection with kasippu distilling. The second news report related to an assault launched on officers at the Minneriya National Forest reserve. Ten suspects including Flower Bud pradeshiya sabha member Jayantha Daladawatte were arrested on charges of attacking the officers of Minneriya national forest reserve. The suspects were remanded until 11 th September after they were produced before the Hingurakgoda magistrate court on the 29 th. The All Island wild life guards association started a trade union action following this assault demanding that the environment shall be created for the wild life officers to discharge their duties unhindered . This action necessitated the closure of Minneriya and Kaudulla wild life sanctuaries . However after these Bud party culprits were remanded , the sanctuaries were re opened on the 29 th (noon) permitting the locals and foreigners to visit the park. Going by this portentous trend , it is a pertinent question whether Namal Rajapakse and his clan too will request that it is the same kasippu dealers and thugs who should be sent to parliament again after fetching their so called ‘people’s force’ to Colombo ?